The direct result of the first Angry Birds came to Android smartphones in July. The game retains the same mechanics to bring down various objects from previous games. The innovations are due to the most beautiful visual and phases divided into stages. Angry Birds 2 also changed the layout of the stage, making it a fun adventure to compete with your friends via Facebook. Rayman Adventures is the right choice when it comes to platform game. The game was released recently, but is a hit of the same studio that gave us Rayman Jungle Run and Fiesta Run. In this entertaining adventure, you help Rayman and Barbara in the mission to recover the Incrediballs. Simple control is compensated with fancy stage and a unique visual style. Fallout Shelter was one of the big surprises of 2015. Developed by the same producer of Fallout 4, the game captures all the atmosphere of the post-apocalyptic role-playing games, but with asset management gameplay. In this game, the goal is to take care of an underground base and help people to repopulate the Earth.! Unpretentious and with the delicate touch of Disney, Frozen Free Fall goes straight to the top of the most downloaded puzzle games of 2015. Shoot memory bubbles and combine them with others of the same color. The synergy between the film's plot and the mobile game is perfect. The game for Android brings over 145 stages alongside the fun characters of the film. Implosion is the most impressive action game released in 2015. In the distant future, mankind left Earth. This way, remaining only creatures called Xada. To destroy them, your character uses the Warmech, a remotely controlled costume. With gameplay style hack'n slash, Implosion has varied stages, giant bosses and a great storyline. In a year where we had fighting games like Mortal Kombat and Marvel Contest of Champions, UFC puts rivals on the ground thanks to more complex controls and a campaign mode much more fun. The game features stunning realism of the sport and a collection of over 70 fighters, including the biggest fighters of the Octagon. Horizon Chase is definitely one of the most important games of the year for Android. Who knew a pseudo Top Gear remake would be released for smartphones? 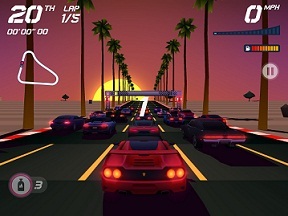 Developed by the Brazilian studio Aquiris and doing honor to the huge success that won the classic in Brazil, Horizon Chase is one of the best games of the year. FIFA 16 takes easily the best sports game of 2015. Relying on the same engine of games for PlayStation 3 and Xbox 360. FIFA 16 brought amazing graphics to the Android smartphones and a realism that was little seen in the cell phones. The game still insists on having only the Ultimate Team mode, but for those looking to play the dream team is enough to render an entire year of pure football fun. As best 2015 Arcade game, we could not help but choose the perfect blend between the old and the new. Pac-Man 256 is the union between Crossy Roads, one of the best games of 2014 with the world's first of the games mascot, Pac -man. In Pacman 256, your mission is to escape the defect that plagued the pinball machines Pac-Man, but needless to say that during the escape you need to eat a lot of points and run down the ghosts that appear along the way.